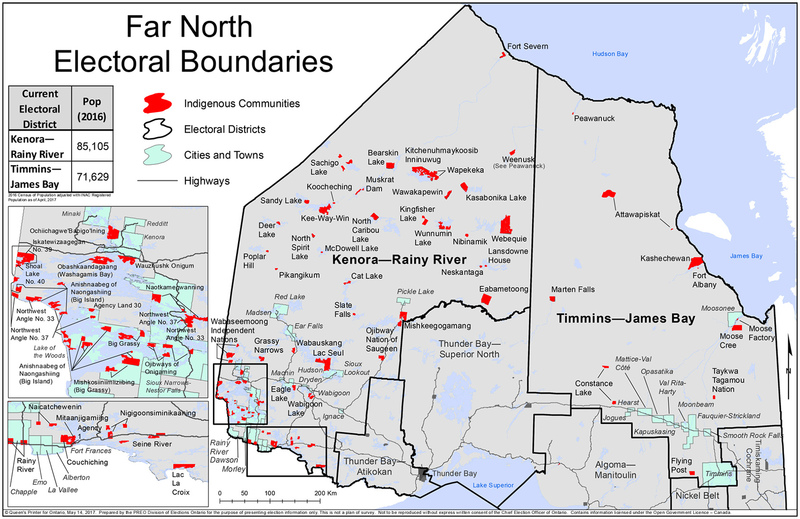 The Far North Electoral Boundaries Commission (“FNEBC”) has been established pursuant to provincial legislation to make recommendations to the Legislative Assembly of Ontario regarding the creation of at least one, and no more than two, new provincial electoral districts (“PEDs”) from the geography of the current PEDs of Kenora—Rainy River and Timmins—James Bay. The FNEBC is also to make recommendations regarding the boundaries and names of these PEDs. The FNEBC released a “Preliminary Report” containing its recommendations on July 10, 2017 and is now delivering this “Final Report” to the Attorney General as required by s. 4(10) of the Representation Act, 2015 . Pursuant to its mandate, the FNEBC conducted public information meetings with communities throughout these geographically vast PEDs in May, June, and July of 2017. The FNEBC also met with the Indigenous political leadership of Grand Council Treaty #3 (“GCT #3”) and the Nishnawbe-Aski Nation (“NAN”) in the Treaty 9 area during their Spring Assemblies in Mitaanjigamiing First Nation and Timmins, respectively. In addition to participating in the Spring Assemblies, the FNEBC also operated an information booth during the Chiefs of Ontario Summer Assembly in Lac Seul First Nation. The FNEBC also met with Members of Provincial Parliament (“MPPs”) from the region. The FNEBC has given close attention to all of the views expressed and explains how it addressed them in the Preliminary Report and this Final Report. The Ontario Legislature established the FNEBC pursuant to the Election Statute Law Amendment Act, 2016, which amended the Representation Act, 2015. Consistent with boundary commission best practices, the FNEBC is a non-partisan entity, established at arms-length from government, and is making its recommendations independently.1 Indicative of the FNEBC’s non-partisanship and independence, the Ontario government is statutorily obliged to introduce legislation to implement the FNEBC’s recommendations. anything else that the Commission considers appropriate. the southern portion of the current PED of Kenora—Rainy River, including Dryden, Fort Frances, Kenora, and Rainy River. The population will be 53,027, 25% of whom are Indigenous and 2% of whom are francophone. the northern, primarily Indigenous portion of the current PED of Kenora—Rainy River, excluding Weenusk (Peawanuck) First Nation. The population will be 32,987, 68% of whom are Indigenous and 1% of whom are francophone. the northern portion of Timmins—James Bay, excluding the City of Timmins, but including Weenusk (Peawanuck) First Nation. The population will be 30,037, 27% of whom are Indigenous and 60% of whom are francophone. the City of Timmins itself. The population will be 41,788, 12% of whom are Indigenous and 36% of whom are francophone. Proposed legal descriptions will follow in Section 9. A map is appended to this Final Report as Appendix A. 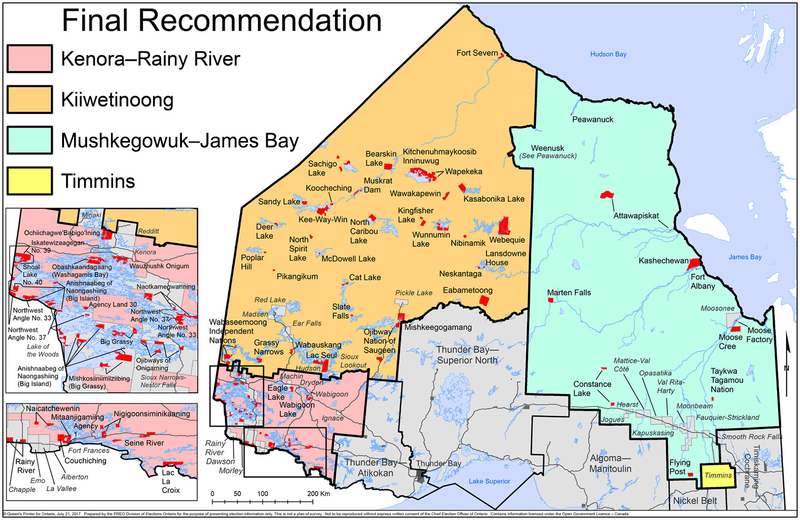 As described in more detail in Section 8, the FNEBC believes this proposed division of the areas of Kenora—Rainy River and Timmins—James Bay into four PEDs balances the criteria the FNEBC was statutorily obligated to consider, while also respecting the constitutional principles of effective representation and representation-by-population, in the context of the geographically vast Far North where there are significant challenges for transportation, communication, and election administration. We believe our proposals will lead to the more effective representation of Ontarians living in the Far North. Notably, the FNEBC repeatedly heard that representation of Indigenous people should be a factor of particular importance. This proposed division will result in a PED—Kiiwetinoong—having a majority (68%) Indigenous population while a second—Mushkegowuk—will have the combined Indigenous and francophone populations comprising 87% of the PED’s population between them. Moreover, both PEDs will have Indigenous names. Simultaneously, as described further below, representation-by-population was duly considered and balanced with the goal of representation of Indigenous people. Pursuant to ss. 4(9) and 4(10) of the Representation Act, 2015 , the FNEBC conducted a second round of public information meetings after the release of the Preliminary Report before delivering this Final Report. The second round provided an opportunity for feedback which could have led to changes before the recommendations in this Final Report were made. The Commissioners were all open to revising their preliminary opinions based on what was learned through the second round of public information meetings. However, with one exception, our conclusions were ultimately reinforced, not only by the feedback we received during the second round, but also by updated data we received regarding the populations of the proposed new PEDs. That one exception related to Marten Falls First Nation, whose Chief indicated that the First Nation wished to have more time to consider whether they would prefer to change the PED in which they are located. The FNEBC encourages the legislature to reach out to Marten Falls First Nation as to its preference to be located in Mushkegowuk or Kiiwetinoong. In 1996, the Ontario government passed the Fewer Politicians Act, 1996 and, in conjunction with it, enacted the Representation Act, 1996 . This legislation had two major consequences. The first was reducing the number of PEDs in Ontario—from 130 to 103. The second was linking the boundaries of the PEDs with those of the Federal Electoral Districts (“FEDs”) defined for federal purposes in 1996, based on the 1991 Census. These changes became effective with the 1999 provincial election. Eleven of the 103 PEDs were located in Northern Ontario: Algoma—Manitoulin, Kenora—Rainy River, Nickel Belt, Nipissing, Parry Sound—Muskoka, Sault Ste. Marie, Sudbury, Thunder Bay—Atikokan, Thunder Bay—Superior North, Timiskaming—Cochrane, and Timmins—James Bay. In 2005, the Ontario government passed the Representation Act, 2005 , dividing Ontario into 107 PEDs. This change became effective with the 2007 provincial election. Ninety-six southern PEDs became coextensive with those defined for federal purposes in 2003, based on the 2001 Census. Northern Ontario, however, had lost one federal seat (thus being reduced to a total of ten) as a result of the 2001 Census. The Representation Act, 2005 preserved eleven PEDs for Northern Ontario by keeping the eleven northern PEDs the same as those defined for federal purposes in 1996 (save for one minor boundary adjustment that does not concern the FNEBC). As a result, Ontario’s electoral boundary legislation no longer automatically linked to the federal readjustment process. In 2015, the Ontario government passed the Representation Act, 2015 , dividing Ontario into 122 PEDs. This change will become effective after the next dissolution of the provincial legislature. There will be 111 southern PEDs following the boundaries defined for federal purposes in 2014, based on the 2011 Census. The eleven northern PEDs retained their names, and their boundaries were redefined. The Honourable Joyce Pelletier of the Ontario Court of Justice (chambered in Thunder Bay), who is Chair of the FNEBC. She is of Ojibwe heritage from Fort William First Nation. 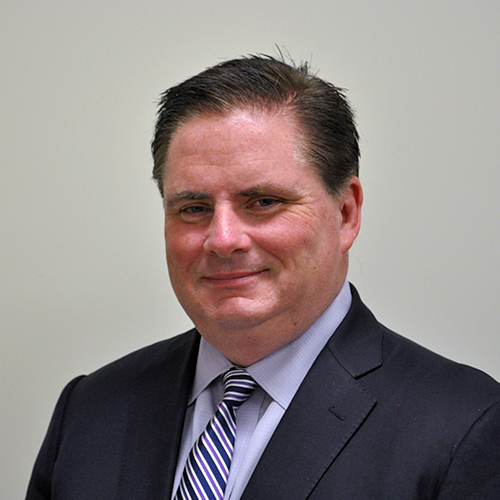 Greg Essensa, Chief Electoral Officer of Ontario. 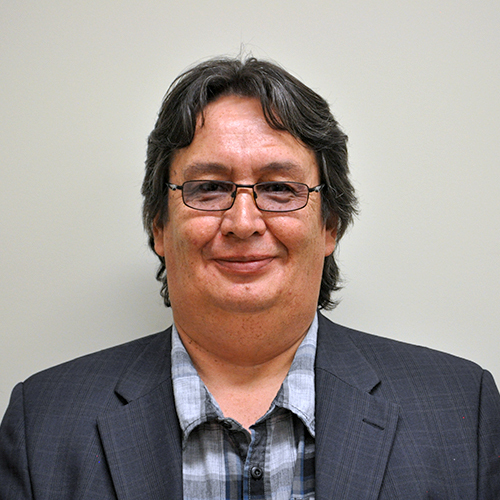 Eric Fisher, former Chief and council member for Wabaseemoong (Whitedog) Independent Nations. He is of Ojibwe heritage from the Wabaseemoong First Nation. 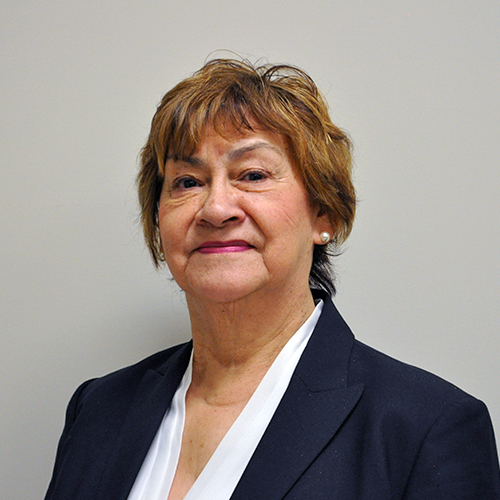 Theresa Hall, former justice-of-the-peace and former Chief of Attawapiskat First Nation. She is of Mushkegowuk heritage from the Attawapiskat First Nation. Michael Pal, Assistant Professor in the Faculty of Law (Common Law) at the University of Ottawa. A list of the FNEBC’s staff appears in Appendix B.
Pursuant to s. 4(7) of the Representation Act, 2015 , the FNEBC is to “consider and make recommendations with respect to the creation of at least one and no more than two additional electoral districts within the geographic areas [of] Kenora—Rainy River and Timmins—James Bay and with respect to the boundaries and names of all of the electoral districts in those geographic areas” [emphases added]. with the boundaries described below in Sections 8 and 9 and illustrated in Appendix A. The FNEBC has considered the need to adopt recommendations consistent with the constitutional object of s. 3 of the Charter. The Supreme Court of Canada’s interpretation of this right is discussed below in Section 6. As explained more fully in Section 7 of this Final Report, pursuant to s. 4(9) of the Representation Act, 2015 , the FNEBC has held two rounds of public information meetings in May, June, and July of 2017, and held other meetings, including with Indigenous organizations in the area, municipalities, and Northern Ontario’s MPPs, as it has deemed appropriate. The FNEBC has, pursuant to s. 4(11) of the Representation Act, 2015 , reached its recommendations by consensus. Come to an agreement with the Chief Electoral Officer and/or the Ministry of the Attorney General on the provision of administrative and operational support to the FNEBC. The goal of reconciliation was reflected in the composition, operations, and mandate of the FNEBC. Three of the five Commissioners are Indigenous, including the Chair. To the best of our knowledge, this is the first electoral boundary commission in Ontario and Canadian history with a majority of Indigenous members. The composition of the FNEBC is designed to engender trust in its work and to provide a confirmation of its independence. The FNEBC operated with the goal of reconciliation in mind and as detailed in this Final Report, met extensively with Indigenous communities, Chiefs, and Councils, GCT #3, and NAN, in its decision-making. The statutory mandate explicitly required us to consider representation of Indigenous peoples (s. 4(8)(b)). In our view, enhanced political representation for Indigenous peoples in Ontario’s political system is a necessary component of the broader movement toward reconciliation. It is important to acknowledge the diverse views within Indigenous communities with regard to participation in the provincial electoral system. Many Indigenous people we met with were strongly in favour of enhanced representation at Queen’s Park. Others, however, expressed ambivalence at involvement in provincial elections because they view the federal Crown as their treaty partner in the nation-to-nation relationship. Some also understood participation in provincial politics as eroding the relationship with the federal government and the move for self-government. We understand and respect these different viewpoints. The FNEBC believes that taking concrete action to improve representation of Indigenous peoples in the provincial legislature is not only part of the FNEBC’s statutory mandate – it is also a vital step on the path toward reconciliation. We return to potential future ways to enhance representation of Indigenous peoples in Section 10. As is clear from the statutory list of factors to be considered in s. 4(8) of the Representation Act, 2015 , specifically ss. 4(8)(a), 4(8)(d), 4(8)(e), and 4(8)(f), the Legislature intended the extraordinary geographic size and unique northern nature of the current PEDs of Timmins—James Bay and Kenora—Rainy River to be of significant importance in the FNEBC’s meetings with the public and decision-making process. The statutory requirement to add at least one, and no more than two, PEDs to the area reflects a desire to ensure effective representation in the Far North, given its size and the challenges in travelling throughout the communities in the two existing PEDs. The FNEBC also heard solid support for effective representation of Indigenous communities, even in non-Indigenous municipalities, in spite of the difficulty this may represent for voter parity. The complete statutory mandate of the FNEBC—s. 4 of the Representation Act, 2015 —is attached to this Final Report as Appendix C.
The PEDs of Kenora—Rainy River and Timmins—James Bay are geographically vast with smaller populations numbers than those in southern Ontario, but the people and communities in the PEDs are diverse, including anglophones, First Nations, francophones, and Métis. In determining the demographics of the Kenora—Rainy River and Timmins—James Bay PEDs, the FNEBC relied on the most recent data on population available from Statistics Canada’s 2016 Census, as well as the population on reserves as provided by the Department of Indigenous and Northern Affairs (“INAC”). The FNEBC recognizes these limitations and appreciates that the available information may not provide a complete picture of the communities in Ontario’s Far North.17 However, the data is also complemented by the FNEBC’s public information meetings. The average population in each of Ontario’s 122 PEDs is 110,234.26 The average population in Ontario’s 11 northern PEDs, however, is 76,330, approximately 30% below the provincial average.27 As explained, this is in part due to the Representation Act, 2005 retaining the 11 Northern Ontario PEDs as per the Representation Act, 1996 , which in turn was based on data from the 1991 Census.28 Kenora—Rainy River and Timmins—James Bay are the largest two PEDs in terms of geography but, as noted below, have the lowest population density with many remote communities. Three treaties cover the areas of the two PEDs: Treaty 9, signed in 1905-1906, with an adhesion added in 1929; Treaty 3, signed in 1873; and Treaty 5, signed in 1875. The 2011 Statistics Canada National Household Survey reports that there are some Métis people that live on First Nations reserves. These figures have limitations similar to the data concerning the area more generally. The FNEBC mapped out the dominant Indigenous languages groups in the PEDs of Kenora—Rainy River and Timmins—James Bay through public information meetings and ongoing discussions with Commission members Eric Fisher and Theresa Hall. The FNEBC appreciates that there are many Indigenous communities that may have dialects distinct from the three main languages. As explained above, the most updated 2016 Statistics Canada data on Indigenous languages will be made available after the FNEBC submits this Final Report on August 1, 2017. While a patchwork of data assembled from multiple sources was used to ascertain and confirm the information provided, the FNEBC recognizes that this gap may lead to an incomplete understanding of the Indigenous languages in these two PEDs. Similarly, the access to government services in Indigenous languages varies immensely and the FNEBC does not have good data regarding their availability. Anecdotally, it appears that the availability of many government services in Indigenous languages is dependent on whether an individual who speaks an Indigenous language happens to have been hired to deliver the relevant service and happens to be working the date that the service is sought. The 2011 Statistics Canada Census reports that 1.48% of the population of Kenora—Rainy River is francophone. The township of Ignace has a population of 1,202, with 7.5% of its residents identified as francophone. This makes it the most francophone community in the PED. The francophone population of Timmins—James Bay is significantly greater, totalling 45.25% of the PED’s total population. The percentage of the population between the two PEDs that is francophone decreased very slightly – by about 1.5% - between 2006 and 2011. It is unclear whether these individuals are Métis. With a total area of 1,078,173.92 km², Ontario is Canada’s second largest province.44 Kenora—Rainy River and Timmins—James Bay contain more than 56% of the total land area (including rivers and lakes), with each PED encompassing 342,629 km² and 254,703 km² respectively. See Appendix D for a map of the current electoral districts. First Nations make up more than 90% of the population in the Far North, with most living in remote, fly-in communities.48 The communities rely on 29 remote airports to provide vital access to the rest of the province, as well as to transport people and goods.49 Weather issues frequently affect airplane travel in the Far North, due to conditions such as fog, storms, floods, fires, etc. During the winter months, fly-in communities, with support from provincial and federal governments, construct and maintain winter road systems. Combined, the winter roads total more than 3,150 km.50 The winter roads link 30 First Nation communities to the provincial highway or rail system for approximately 10 to 12 weeks per year.51 The winter road network is crucial to transporting supplies and bulk cargo into the communities. The winter road access for the communities of Weenusk (Peawanuck) and Fort Severn First Nations is to Manitoba. The limited road infrastructure in Ontario’s Far North also intensifies the costs, uncertainty, and availability of northern traveling, food and other goods, and professional services, as well as impacting the ability to travel for medical purposes.55 In addition, other factors including physical terrain, environmental conservation, differing perspectives and varying degrees of consensus among communities, and complications arising from multiple funding sources further exacerbate the difficulty of Far North communities to optimize existing and build new transportation infrastructure.56 In addition, challenges exist with respect to sustained multi-year funding, which in turn makes long-term planning challenging. Section 3 of the Charter guarantees every citizen of Canada the right to vote in an election of members of the House of Commons or of a legislative assembly, and the right to be a candidate for elected office. The Nova Scotia Court of Appeal, in Reference re the Final Report of the Electoral Boundaries Commission 65 (“ Nova Scotia Reference ”), recently provided further interpretation of the role of electoral boundary commissions. The Court of Appeal explained that while there is no constitutional requirement that an independent boundaries commission be established, whatever body is tasked with crafting electoral boundaries is mandated to weigh the constitutional criteria of effective representation enshrined in s. 3 of the Charter .66 Such bodies therefore take their mandate from both their statutory terms of reference and the constitutional criteria of effective representation.67 In Nova Scotia Reference itself, the government refused to allow and/or accept any recommendations that deviated from a 25% voter parity requirement, irrespective of consideration of the value of minority (specifically, Acadian and Black) representation. This fettering of the Commission’s discretion meant that the Commission’s true views on what would facilitate effective representation were not considered. Section 3 of the Charter was therefore violated. Voter parity remains the primary criterion in the redistribution of electoral districts. As noted above, the average population of PEDs in Ontario is approximately 110, 234 while the combined total population of both Kenora—Rainy River and Timmins—James Bay is only 156,734. As such, the two PEDs already have populations that exceed the generally allowable +/- 25% variance under federal legislation, which has been indirectly used to draw most PEDs in Ontario since 1995.69 However, the population density of these two PEDs is by far the smallest in the entire province, being 0.28 persons per square kilometre in Timmins—James Bay and 0.25 persons per square kilometre in Kenora—Rainy River. By comparison, the population density in the PED of Davenport is 8,798 persons per square kilometre – a more than 38,000 fold difference from Kenora—Rainy River. 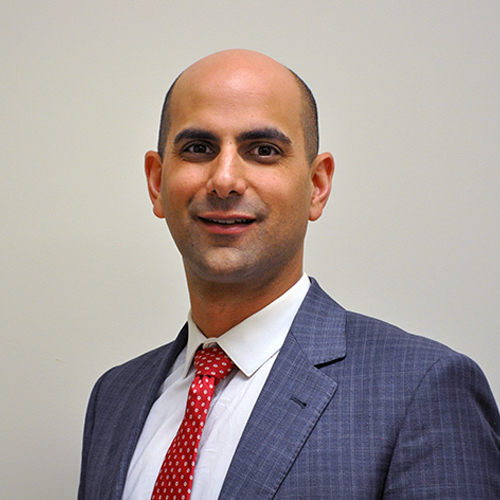 Note: After the Final Report was delivered to the Attorney General of Ontario, the Honourable Minister Yasir Naqvi, on August 1, 2017, it came to the attention of the Commissioners of the Far North Electoral Boundaries Commission, 2017, that the population densities of the current provincial electoral districts of Kenora—Rainy River and Timmins—James Bay were incorrectly calculated. The actual present population density of Kenora—Rainy River is 0.25 people per square kilometer, instead of 0.23, and 0.28 people per square kilometre in Timmins—James Bay, instead of 0.33. This errata corrects that error at the request of the Far North Electoral Boundaries Commission. This variation in population density had no impact on the final recommendation of the Far North Electoral Boundaries Commission. The majority of the population of Kenora—Rainy River and Timmins—James Bay reside in the southern portion of each PED, making it even more difficult to provide effective representation to those living in the northern parts of the PEDs. The mandate of the FNEBC also requires us to add at least one, and no more than two, PEDs to this area. We interpreted our mandate as permitting larger than normal deviations from voter parity, in order to take into account the large geography of the region and the need to enhance Indigenous representation, while still respecting the need to have PEDs of roughly equal population. In fact the legislature has already accepted that representation in the north will of necessity be different when it decided to retain 11 Northern Ontario PEDs. The FNEBC is therefore more attentive to voter parity between Northern Ontario PEDs than that which distinguishes northern and southern PEDs. That said, the clearly mandated objective of seeking to achieve Indigenous representation will put further pressure on the general objective of voter parity. In our view, the more specific objective of Indigenous representation must be given more weight in light of the need to remedy past injustices and provide a means for Indigenous communities to meaningfully participate in the governance of the province. The FNEBC officially began its work after the Chair was appointed on May 2, 2017. It was statutorily obliged to deliver this Final Report to the Attorney General 90 days later—that is, on or before August 1, 2017. The limited time frame in which it could work, coupled with the vast geographical region that Kenora—Rainy River and Timmins—James Bay encompass, posed many challenges. The FNEBC endeavoured to meet with a mix of urban centres, including those with majority francophone populations, and First Nation communities. In order to reach as many people as possible within a limited time-frame, the FNEBC prioritized the densest populated centres which were also in close proximity to other smaller communities. Smaller communities were invited to attend the public information meetings in larger centres in order to have their voices heard. The FNEBC conducted seventeen public information meetings in First Nations and municipalities in the first round of public information meetings. The FNEBC conducted four further public information meetings in the second round of public information meetings. Though this was an ambitious task, the FNEBC wishes it could have visited even more First Nations and municipalities. It was important for the FNEBC to receive as much feedback from as many communities across the Far North as possible. The FNEBC also had a booth at the Summer Assembly of the Chiefs of Ontario, and attended the Spring Assemblies of NAN and GCT #3. Each public information meeting followed the same procedure. Community members who attended the public information meeting were able to sign up to make a deputation to the panel of commissioners. Each commissioner introduced themselves before the Chair made a presentation regarding the mandate of the FNEBC. After the formal presentation, deputations from the public were made and a record of the feedback was maintained. Website: The FNEBC developed and maintained a website at http://www.fnebc-cdcegn.ca. The website was one of the online platforms that the public could use to retrieve information regarding public information meeting schedules, news releases, general contact information for public feedback, as well as maps on the current and sample electoral boundaries. Information on the website was initially provided in English and French. Over 9,500 new users visited the website. E-mail: The FNEBC maintained a general e-mail address at info@fnebc-cdcegn.ca for the public to send questions or provide feedback. Social Media: The FNEBC also used Twitter and Facebook to raise awareness of the FNEBC’s activities and encourage public engagement. The Twitter accounts, @ONfnebc (English) and @ONcdcegn (French), were used to tweet updates to the FNEBC’s activities and schedule. The FNEBC’s English and French Facebook pages provided similar information. Facebook events were created and promoted in English and French for each public information meeting. A general awareness advertisement campaign also ran on Facebook, targeting users in the area to either like the page or visit the website for more information about public information meetings. Media Interviews: The Chair of the FNEBC took part in radio and on-spot news interviews with media outlets such as CBC News Sudbury and Sudbury’s French Newspaper, Le Voyageur, as well as Thunder Bay NewsWatch. Information was provided to the Dryden Observer and the Thunder Bay Chronicle Journal. The Sioux Lookout Observer also published a story including an interview with Justice Pelletier. The local Timmins newspaper also conducted an interview. Radio interviews were conducted with ICI Radio-Canada in Timmins and Q104 in Kenora during the second round of public information meetings. Media from #ONfr with TFO.org also reached out and were provided with information. General Information Phone Line: A general information phone line was made available. Regular Mail and Physical Office: The FNEBC’s office at 981 Balmoral Street, Suite 101, Thunder Bay ON P7B 0A6 was open weekdays to allow members of the public to visit in-person and obtain or leave information. Local Newspapers and Radio: The FNEBC used the Ontario Public Service’s vendor of record for public notices to advertise upcoming community public information meetings in the local newspapers and on local radio stations. The advertisements were made available in each market in both English and French. Though the FNEBC used the word “consultation” to describe many of its public information meetings, these were not “consultations” within the meaning of section 35 of the Constitution Act, 1982 as the FNEBC’s mandate does not affect any claimed or established right under that section of the Constitution Act, 1982. Of the seventeen public meetings during the first round, five were First Nations in Kenora—Rainy River (Fort Severn, Eabametoong, Lac Seul, Wabaseemoong, Wabauskang), four were First Nations in Timmins—James Bay (Attawapiskat, Constance Lake, Fort Albany, and Moose Cree), four were municipalities in Kenora—Rainy River (Dryden, Kenora, Sioux Lookout, and Red Lake), and four were municipalities in Timmins—James Bay (Timmins, Smooth Rock Falls, Kapuskasing, and Hearst). This led to a total of nine public meetings with First Nations compared to eight with municipalities. There was a total of nine public meetings in Kenora—Rainy River compared to eight in Timmins—James Bay. Of the four public information meetings during the second round, three were “second visits” to municipalities while one was to visit an Ojibwe-speaking First Nation whose feedback was particularly needed. Two of the four public information meetings were in Kenora—Rainy River while two were in Timmins—James Bay. Due to scheduling conflicts and cancellations, the FNEBC was unable to meet with a number of tribal councils or with the Métis Nation of Ontario (MNO). The FNEBC also attended NAN’s Spring Assembly on May 10, 2017 and GCT #3’s Spring Assembly on May 16, 2017. At these meetings, the FNEBC gauged the interest of the communities and also received feedback regarding what communities should be visited during the public information meeting process. A summary of these meetings follows below. Pursuant to s. 4(8)(g) of the Representation Act, 2015 , the FNEBC met with MPPs representing Northern Ontario. All 11 Northern MPPs were invited to a meeting held on May 29, 2017. Gilles Bisson, MPP for Timmins—James Bay, was the only MPP to attend, though others sent staff members. The FNEBC later met with Sarah Campbell, MPP for Kenora—Rainy River, on June 13, 2017 at Sioux Lookout. Their opinions are summarized below. The FNEBC held two rounds of public information meetings across the current PEDs of Kenora—Rainy River and Timmins—James Bay. The first round of meetings took place from May 8, 2017 to June 22, 2017. The second round of public information meetings took place the week of July 10, 2017. This section reviews the main comments heard during the public information meetings, as well as providing an overarching summary of the trends and feedback. We note that some members of the public expressed concern that dividing the PEDs of Kenora—Rainy River and Timmins—James Bay would affect friendship agreements, the provision of social services, etc. The FNEBC wishes to emphasize that this is not the case at all. Changes to electoral boundaries do not affect other geographic divisions used by the provincial government such as School Board Districts, Social Services Boards, etc. as these are set by Ontario via specific legislation and not tied to PED boundaries. Nor are matters such as economic or other partnerships, friendship agreements, etc.affected by PED boundaries. At Wabaseemoong Independent Nation on May 30, 2017, fourteen members signed in and approximately 30-35 attended the public information meeting, including the Chief. Strong preference was expressed for adding two additional new PEDs. Concern was expressed that the addition of one PED would result in a PED that remains too vast and difficult to travel within. Members proposed that the line separating the southern and northern portions of Kenora—Rainy River be drawn at the CN rail line south of Sioux Lookout. The May 31, 2017 public information meeting in Wabauskang First Nation was attended by seven people, including Elders and councillors. At the meeting, members present expressed a preference for a new PED that follows treaty boundaries. It was noted that the “distance for travel” of MPPs was a matter of great importance and that the communities north of Wabauskang had a great need for increased representation. Two public information meetings took place in Constance Lake First Nation on June 7, 2017 – the first meeting took place with Chief Rick Allen, while the second had eight community members in attendance. There was similar feedback received during both sessions. It was proposed that a seat in the legislature be guaranteed to each tribal council, as this would ensure communities’ voices are heard at Queen’s Park. There was clear sentiment in both meetings that increased representation of Indigenous communities is needed, and that this could possibly be achieved through establishing a “mini-Queen’s Park” for Northern Ontario. There was also preference for creating two primarily Indigenous PEDs, in the northeastern and northwestern areas of the current PEDs of Kenora—Rainy River and Timmins—James Bay. Were Timmins—James Bay to be divided “in two”, members commented that they would prefer Constance Lake First Nation be a part of the northern, primarily Indigenous PED. The community favoured the possibility of having constituency offices in each First Nation. Some members also voiced apprehension about using treaty lines as the basis of drawing the PEDs. It was also expressed that First Nations are in a nation-to-nation relationship with the federal rather than the provincial government. Seventeen people attended the public information meeting in Eabametoong First Nation on June 18, 2017. There was clear support for the creation of a total of four PEDs. Individuals commented that having the two additional PEDs would lead to more effective representation of northern communities and Indigenous peoples. Many members commented on the different needs facing fly-in communities versus communities with access to all-season roads, and the importance of having a representative who understands the nuances of these different interests, including the cost of living, food and transportation. Traditionally, the people of Eabametoong First Nation are connected to the communities near Lake Nipigon which are part of the Thunder Bay—Superior North PED. Individuals noted that Eabametoong First Nation should not be added to a potential northeastern PED given the differences in language. However, it was commented that Eabametoong First Nation and Mishkeegogamang First Nation work closely and should be kept together. On June 20, 2017, the FNEBC visited the community of Fort Severn First Nation. There were nineteen people in attendance. As noted in other public information meetings, it was stated that remote communities should be grouped together as this will increase the likelihood of a northern candidate who shares the values and interests of these communities. In addition, the importance of ensuring more effective representation of Indigenous peoples was repeatedly underscored. Fort Severn First Nation is a fly-in community with no road or rail access. The community has limited connection to other coastal Cree communities, but does have connections to Sioux Lookout and Pickle Lake as all flights are chartered from these communities. It is only during the winter road season that the community has access to the eastern areas of Ontario’s Far North. As such, community members voiced their preference for politically remaining part of the western portion of Ontario’s Far North – what is currently the PED of Kenora—Rainy River. On National Aboriginal Day, June 21, 2017, the FNEBC visited the community of Attawapiskat First Nation. Rather than holding a formal public information meeting, the FNEBC set up an information booth in the parish hall for members of the community. Over the course of the day, approximately twenty individuals provided feedback. Overall, most individuals were in favour of adding two additional PEDs in the Far North and indicated that the community would likely endorse such a proposal. They commented that a total of four PEDs would assist in ensuring that issues important to them are heard in the provincial legislature. On June 22, 2017, the FNEBC visited Moose Cree First Nation. Two community members attended the public information meeting. One community member expressed his support for a four PED proposal with Timmins, Kapuskasing, and Hearst remaining grouped together in their own PED. He noted that Indigenous representatives are necessary for the future of First Nations communities and in helping achieve the objective of reconciliation. It was commented that history and geography are the most important factors in determining boundary lines. Both members stated that increasing the number of PEDs in Ontario’s Far North presents itself as a key opportunity to increase effective representation. A MoCreebec representative spoke to the Chair after the public information meeting, mainly seeking information and not expressing a strong opinion on what the FNEBC should recommend. The FNEBC held a public information meeting in Fort Albany First Nation on June 22, 2017. More than seven community members attended the meeting.72 Additionally, members voiced their concerns over the challenges a representative from a Far North community would face in seeking an MPP position. Issues of voter turnout, simplifying the advanced and special ballot voting procedure, and concerns over financial constraints for campaigning were the foremost issues raised during the meeting. Community members generally supported a four PED option with Timmins, Kapuskasing, and Hearst remaining grouped together and a second PED being created for the most northern, primarily Indigenous communities. It was highlighted that this would be the best option for increasing the likelihood of an Indigenous representative in the provincial legislature. Eight individuals, two of whom were members of media, attended the public information meeting in Kenora on May 30, 2017. Individuals expressed the view that Treaty 3 should all be in one PED, as Dryden and Kenora are the service centres for many First Nations in Treaty 3. It was highlighted that it would be unfortunate to lose these connections, given that First Nations and municipalities have worked together for many years. Additionally, preference was expressed for two new PEDs, as it was highlighted that there are different needs in the Far Northeast than the Far Northwest. These views were not unanimously held, however. One individual thought that PEDs and FEDs should align with each other. Another individual expressed concern over the potential dilution of votes in the southern PEDs. Five community members attended the May 31, 2017 public information meeting in Dryden. One person noted that the need to increase Indigenous representation was very important. The community members all expressed the view that the infrastructure of the Far North needed to be taken into account when making recommendations. The community was divided about whether one or two new PEDs should be added. One person thought one was insufficient, but respected that adding two would lead to PEDs with very small populations. Three people attended the June 5, 2017 public information meeting in Timmins. Timmins was described as the “service hub” for towns such as Kapuskasing, Hearst, and other francophone communities along Highway 11, as well as Indigenous communities. There was simultaneously concern, however, that separating Kapuskasing and Hearst from a prospective northeastern PED would lead to the PED not having a “service hub”. Comments were made regarding the similar interests of fly-in communities in the northwestern and northeastern areas of Ontario’s Far North. It was noted that the rail connection to Moosonee leads to some notable differences between Ontario’s northeastern and northwestern communities. Members from Timmins did note the ongoing difficulties of running a campaign in the Far North, particularly the challenges facing travel to fly-in communities. Individuals also highlighted that it would be beneficial to have an Indigenous representative at Queen’s Park as it would more clearly bring attention to the issues facing communities in Ontario’s Far North. Three members of the community attended the public information meeting in Smooth Rock Falls on June 6, 2017. Keeping Hearst, Kapuskasing, and the other “Highway 11 communities” together in a single PED with Timmins was supported as these are “communities of interest” that share similar political concerns. The preference was for creating two additional PEDs as there is a perceived need for increased northern representation. One member said it was important to create a PED that would produce an Indigenous representative, with this being “not only important to the Indigenous people, but to the entire region that more Indigenous people have a voice. Having an Indigenous representative in Toronto is vital”. Three community members attended the June 6, 2017 public information meeting in Kapuskasing. It was noted that the northern portion of the present PED of Timmins—James Bay is a large geographical area to cover, with no roads to the communities. This was highlighted as a reason to prefer four PEDs to three. Preference was also expressed for Timmins to be in its own PED as the dominant industry in Timmins is mining, but the dominant industry in the Highway 11 communities is forestry. Having the James Bay Cree communities in a new PED with Hearst and Kapuskasing was not considered problematic. This was because the new PED would have a higher percentage of Indigenous population than is presently the case, and Kapuskasing maintains a work and service relationship with the communities on the James Bay Coast. Six people attended the June 7, 2017 public information meeting in Hearst. Residents expressed the view that communities such as Hearst, Smooth Rock Falls, and Kapuskasing would be more able to advance their priorities in a PED that excludes Timmins, which currently has over half of the population of Timmins—James Bay. It was suggested that the Highway 11 communities would “have a greater voice” if Timmins were in a separate PED. This would be important to the Highway 11 communities as Timmins’s economy is based in mining, while the Highway 11 communities are based in forestry. Lastly, the community members raised questions on how to facilitate “better representation of different groups” while noting that growth rates between populations vary, with some communities currently experiencing a population decline. Fifteen community members attended a public information meeting in Sioux Lookout on June 13, 2017. The general sentiment from the participants was that the most important statutory criterion is Indigenous representation in the Ontario legislature. One participant commented that Indigenous representation should be considered as important as voter parity. It was also expressed that geography was a paramount factor and should be considered when balancing with voter parity. Adding two PEDs was the preferred option. Participants discussed the three communities of Wabauskang, Wabaseemoong, and Grassy Narrows First Nations. Overwhelmingly, the participants suggested that these communities should stay with Kenora if the PED were to be split into two. These communities rely heavily on Kenora for services, they are drive-in communities, and have historic and family ties to Kenora. It was expressed that Sioux Lookout be included in a northern PED with the remote Indigenous communities, as Sioux Lookout is the transportation hub for all of the Far North and services such as child services and healthcare are administered out of Sioux Lookout. Further, it was also explained that Sioux Lookout has a great deal of capacity to deal with the needs of the Far North as well as a wealth of knowledge and family connections to the area. Ten people attended the public information meeting in Red Lake on June 14. Participants expressed an interest in contiguous and non-contiguous PEDs, as well as boundaries that followed the treaty lines. There was a discussion as to whether Red Lake should be in a southern PED with Kenora or in a potential northern PED with the remote fly-in communities. A participant advocated to have Red Lake in a southern PED with Kenora as Red Lake does not have the same connection to the more northern remote communities but instead has a social and economic connection to the south as it is a mining community. A city councillor explained, however, that the Town of Red Lake is making a concerted effort to establish partnerships with remote Indigenous communities. The Town of Red Lake has a long-term goal and developed a strategic plan of establishing a “hub-like” relationship with the northern Indigenous communities, akin to Sioux Lookout. For that reason, the municipal representatives advocated that the Town of Red Lake should be placed in the northern PED. Three community members attended a public information meeting on July 10, 2017 in Grassy Narrows First Nation. Those in attendance expressed their interest and support in increasing representation of Indigenous peoples in the provincial legislature. While there were some comments about the community’s connection to southern cities such as Kenora, there was a clear and unequivocal preference for being placed in the northern PED due to the greater probability of an Indigenous candidate. It was stated that an Indigenous MPP would understand the specific interests and issues present in the northern, primarily Indigenous, communities. On July 11, 2017, the FNEBC held a second public information meeting in Kenora. There were 10 community members in attendance. Questions were asked about the likelihood of the FNEBC’s recommendation being implemented, as well as about the feedback received from northern communities. Overall, there was general support for the FNEBC’s preliminary recommendation and enhancing the representation of Indigenous peoples in the provincial legislature. The FNEBC conducted a second public information meeting in the city of Timmins on July 12, 2017. There were twelve community members in attendance, including the current MPP for Timmins—James Bay, Gilles Bisson, as well as the Mayor of Timmins, Steve Black. Many of the attendees had identified political affiliations. Two contradicting opinions emerged. Those against the proposed “Timmins alone” PED noted that Ontario’s northern communities have unique needs and require a candidate from that area that will be able to both understand and effectively represent them in Queen’s Park. Additionally, these members felt that including the Highway 11 communities in the Mushkegowuk PED reduces the probability of an Indigenous candidate being elected to the provincial legislature. In contrast, others present felt that the “Timmins alone” PED was sufficient, noting that interests of the city are different than the coastal and Highway 11 communities. In addition, one member expressed interest in keeping the Timmins—James Bay PED “as is”. The Mayor of Timmins, Mr. Black, expressed his support for the proposed PED of Timmins, stating that the focus should be on ensuring better representation and servicing of First Nations communities. He highlighted that the City of Timmins would continue to work with northern communities even if they are not in the same PED. He also suggested that there would have been stronger turnout at the public information meeting in Timmins had there been strong opposition to the recommendations contained in the FNEBC’s Preliminary Report. The second public information meeting held in Hearst on July 13, 2017 was attended by twenty-three people, including the Mayor of Hearst. There was endorsement for the FNEBC’s preliminary recommendation for adding two additional new PEDs. The community expressed their interest and support in developing a closer relationship with the northern First Nation communities, particularly as the communities face some similar issues. NAN Chiefs Spring Assembly The FNEBC attended the NAN Chiefs Spring Assembly on May 9, 2017 in Timmins. The FNEBC led a formal presentation during the assembly and also held an informal public information meeting after the presentation which individuals could attend, learn more about the FNEBC’s mandate, and provide direct feedback to the Commissioners. Approximately eight individuals attended the informal meeting, including Grand Chief Alvin Fiddler.The feedback received during the informal meeting included advice to the FNEBC on which communities to visit and how the PEDs should be created. One participant highlighted Marten Falls First Nation’s connection to the current PED of Kenora—Rainy River, the friendship accord between Lac Seul First Nation and Sioux Lookout, and proposed that the PEDs be based around the main language groups: Ojibwe, Oji-Cree, and Cree. Grand Council Treaty #3 National Assembly The FNEBC attended the Grand Council Treaty #3 National Assembly on May 16, 2017 in Mitaanjigamiing First Nation. The FNEBC gave a formal presentation and the Chair provided time for questions and feedback. The feedback largely focused on concerns over the right to self-determination. Other members, however, highlighted the importance of promoting engagement and improving representation of Indigenous peoples in the provincial legislature. In addition to these comments, invitations and information on the communities to visit during the first round of public information meetings were also received. Chiefs of Ontario Assembly The FNEBC set up a vendor booth at the Chiefs of Ontario assembly in Lac Seul First Nation on June 13, 2017. Approximately thirty-five people visited the vendor booth. The feedback largely focused on the friendship accord between Lac Seul First Nation and Sioux Lookout, as well as the socioeconomic, transportation, and service connection Sioux Lookout maintains with many other First Nations communities in Ontario’s Far North. Joint NAN/GCT #3 Meeting The FNEBC held a joint meeting with Grand Chief Alvin Fiddler of NAN and Grand Chief Ogichidaa Francis Kavanaugh on June 12, 2017 in Sioux Lookout. The meeting was to inform the Grand Chiefs of the work completed to date by the FNEBC, and the communities that would be visited. Sample maps were provided for the Grand Chiefs to review with their Assembly of Chiefs and to provide written submissions if they wished to do so. Pursuant to s. 4(8)(g) of the Representation Act, 2015 , the FNEBC sought input from MPPs representing Northern Ontario. All 11 Northern MPPs were invited to a public information meeting held on May 29, 2017. Gilles Bisson, MPP for Timmins–James Bay, was the only MPP to attend, though others sent staff members. Mr. Bisson expressed that there should be two additional PEDs, and that the primary factor to be considered in how to draw the boundaries of the new PEDs should be giving a voice to First Nations communities. Mr. Bisson noted that it is exceptionally difficult to represent fly-in only communities given MPPs’ limited budgets for travel and that an exception to the spending limit per population should be created for any PEDs where a significant percentage of the population cannot be accessed via road. Mr. Bisson also provided the FNEBC a written submission following the release of the Preliminary Report to re-state his opinion that the PEDs should be drawn with Indigenous representation as the primary factor. Sarah Campbell, MPP for Kenora–Rainy River, attended the public information meeting at Sioux Lookout on June 13, 2017. Ms. Campbell favoured the creation of two additional PEDs in Ontario’s Far North as a three-PED solution would create one large PED that would be extremely difficult to service. She noted that financial constraints are a large barrier to accessing remote communities and ensuring effective representation. She highlighted that her operating budget only allows her to complete two trips to the Far North per year. Ms. Campbell emphasized the importance of representation of Indigenous people in the provincial legislature, and that this would be best achieved with a four PED option. The FNEBC received feedback through multiple avenues including e-mail and written submissions. Approximately 11 submissions were received by e-mail or in writing. Of the e-mail submissions received, there were some contradictory recommendations. This included, for example, adding only one Far North PED including all First Nations communities versus the creation of two additional PEDs for the Far Northwest and Far Northeast communities. Several submissions suggested that representation of Indigenous persons was the paramount consideration, while the FNEBC also received a written submission from a community member stating that representation-by-population should be the chief consideration in determining the PEDs and urged the FNEBC to recommend the creation of one PED that was configured to keep the populations close to the provincial electoral quotient. A detailed letter from the Mayor of Sioux Lookout, Doug Lawrance, was sent to the FNEBC about the importance of Sioux Lookout’s historical and growing community and economic ties with First Nation communities in the Far North. In addition, the FNEBC also received written submissions from Assemblée de la francophonie de l’Ontario and the Office of the French Language Services Commissioner that strongly endorsed the recommendations in the Preliminary Report with regard to the creation of two PEDs in the Timmins—James Bay area. Although the creation of the two additional PEDs results in a total population below the 25% federal parity level, both submissions expressed their appreciation that the FNEBC maintained a proper balance between voter parity and enhancing effective representation of Indigenous and francophone communities. The FNEBC did not receive any written submissions from Indigenous organizations. No feedback – negative or positive – was received from Indigenous organizations after the release of the Preliminary Report. Our statutory mandate requires us to add at least one, and no more than two, additional PEDs in the Far North. We propose that two should be added. The overwhelming consensus from feedback the FNEBC received was to create two additional PEDs, for a total of four, in the current territories of Kenora—Rainy River and Timmins—James Bay, given the difficulties in ensuring effective representation for the Far North. It would have been truly unexpected for residents of the communities within Kenora—Rainy River and Timmins—James Bay to have requested less representation. Nonetheless, this recommendation seems appropriate due to the large geography of the Far North and the way populations are distributed. This conclusion was bolstered by the overwhelming consensus in the public feedback that increasing the representation of Indigenous communities in the provincial legislature should be a factor of particularly great importance. We heard this input from both Indigenous and non-Indigenous communities. Accordingly, we recommend the creation of four PEDs in the Far North. Our next task was to set the boundaries and the names of the four PEDs. Kenora—Rainy River: comprising the southern portion of the current PED of that name, including Dryden, Fort Frances, Kenora, and Rainy River. The population will be 53,027, 25% of whom are Indigenous and 2% of whom are francophone. Kiiwetinoong: comprising the northern, primarily Indigenous portion of the current PED of Kenora—Rainy River, excluding Weenusk (Peawanuck) First Nation. The population will be 32,987, 68% of whom are Indigenous and 1% of whom are francophone. Mushkegowuk: comprising the northern portion of the current PED of Timmins—James Bay, excluding the City of Timmins, but including Weenusk (Peawanuck) First Nation. The population will be 30,037, 27% of whom are Indigenous and 60% of whom are francophone. Timmins: comprising the City of Timmins itself. The population will be 41,788, 12% of whom are Indigenous and 36% of whom are francophone. More precise descriptions follow below in Sections 8(b) and 9. Further explanation of the names follows in Section 8(d). We believe this option is the most consistent with the relevant legal and constitutional criteria we are obliged to consider, the public feedback we received, and the challenges inherent in ensuring effective representation given the vast geography of the Far North. There are myriad advantages to this proposal. First, this is the proposal that leads to four PEDs that is most respectful of representation by population. There is relative equality within the Far North PEDs. The two southern and more urban PEDs have similar total populations. The two northern PEDs also have relatively similar populations. Other options that we considered would have resulted in PEDs with much lower populations. Our proposal respects the constitutional principle of representation-by-population to the extent possible given the distribution of population across a large area. Second, the PEDs are more geographically manageable than the status quo while also geographically manageable in and of themselves. This respects and takes into consideration the statutory principles of geographic features, sparsity, density and the rate of population growth in the geographic areas, and the availability and accessibility of means of communication and transportation in the geographic areas. We also took into account election administration. The more manageable size of the PEDs will facilitate Elections Ontario administration of elections in each PED, by minimizing transportation and communication difficulties, to the extent possible, within each district. Third, it will create one PED—Kiiwetinoong—with a majority Indigenous (Ojibwe, Oji-Cree, and Cree) population, and a second PED—Mushkegowuk—with a substantial Indigenous (Cree) population, and a large majority of the population (combined 87%) being either Indigenous or francophone. Enhancing Indigenous representation is very important in this period of reconciliation in Canadian history, as is reflected in the statute. The Indigenous population will have an enhanced opportunity to benefit from effective representation and to elect representatives of their choice, particularly in Kiiwetinoong, but also in Mushkegowuk. Fourth, effective representation will be facilitated by respecting the diversity of the Indigenous peoples of the Far North and reflecting their wishes. The Indigenous population of Mushkegowuk will be primarily Cree while Kiiwetinoong will be primarily Oji-Cree and Ojibwe. Moving Marten Falls to be in the PED that shares a common language and history originally struck us as appropriate, though we then learned from the Chief of Marten Falls First Nation that the First Nation wished to have more time to consider whether they would prefer to change the PED in which they are located. The FNEBC encourages the legislature to reach out to Marten Falls First Nation as to its preference to be located in Mushkegowuk or Kiiwetinoong. Similarly, moving the boundary to incorporate Weenusk Reserve with the village of Peawanuck is appropriate given the linkage between the two—Weenusk is a summer gathering place for Weenusk (Peawanuck) First Nation, who now live in Peawanuck. The present “straight line” that divides Kenora—Rainy River and Timmins—James Bay did not accommodate these linkages. Moving Weenusk (Peawanuck) First Nation accordingly respects the statutory criteria of representation of Indigenous people and representations of interested persons. We also note that Fort Severn First Nation, although being a Cree First Nation, explicitly requested to remain in the northwestern PED, as their infrastructure is connected to the west, and Sioux Lookout is their primary service centre. Fifth, it was clear from speaking to the residents of Kiiwetinoong that they wish for Sioux Lookout to be in Kiiwetinoong, as Sioux Lookout (which has a significant Indigenous population) is their “service centre” and they wish to have an MPP who is an “advocate” for that service centre. Sioux Lookout’s representations to the FNEBC enthusiastically supported this idea, noting the good relationship between the Indigenous population in Sioux Lookout, the non-Indigenous population in Sioux Lookout, and the nearby Indigenous population. Including Sioux Lookout in Kiiwetinoong also increases the similarity in population between the four PEDs. This respects the statutory criteria of communities of interest and representation of Indigenous people, in addition to the constitutional principle of representation-by-population. Sixth, the creation of a francophone majority PED, only the second in the province (after Glengarry—Prescott—Russell), will enhance the effective representation of that group. It also reflects ties between the francophone communities north of Timmins and Indigenous communities. The predominantly francophone communities along Highway 11 such as Hearst and Kapuskasing indicated a desire to be in a PED with the Cree population to their north. These francophone communities have economies largely based in the forestry industry while Timmins’s economy is largely based in the mining industry. Moreover, the Cree communities in the northern part of Timmins—James Bay indicated a trust of and willingness to work with the francophone communities along Highway 11 on areas of common concern. This approach respects the statutory criteria of communities of interest. Seventh, the proposed PED of Timmins will be a compact urban PED, akin to Sudbury or Sault Ste. 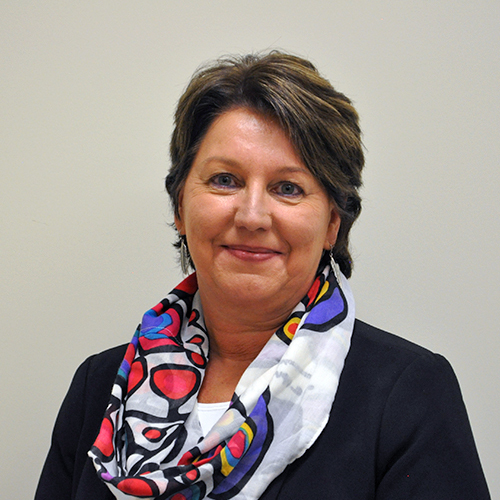 Marie, leading to more effective representation of Timmins and consistency with the representation of Sudbury and Sault Ste. Marie. This respects the statutory criteria of communities of interest and municipal boundaries. Eighth, the population of the new proposed PED of Kenora—Rainy River will consist primarily of the southernmost portion of the current PED of Kenora—Rainy River. The new proposed PED will have a fairly common economy, and a much more compact geography, leading to more effective representation, respecting the statutory criteria of geographical features and sparsity, density and the rate of population growth in the geographic areas. Ninth, the FNEBC repeatedly heard that language was tremendously important in the Far North, with the Cree, Oji-Cree, Ojibwe, and French languages all being important to various communities. This proposed division attempts to respect the locations of different linguistic communities to the extent possible. Tenth, even though the populations will be small by the standards of Ontario PEDs, creating separate PEDs of Kiiwetinoong and Mushkegowuk leads to them having more manageable geography, respecting the statutory criterion of geographic features. If they were to be merged into a single PED, it would be geographically enormous – larger than the present district of Kenora—Rainy River. It would be difficult to effectively represent such a PED, much less be effectively represented in it. Given the unique nature of Northern Ontario, and specifically the Indigenous communities, which have relatively high rates of population growth compared to the non-Indigenous population,73 that live in the proposed new PEDs of Kiiwetinoong and Mushkegowuk, the FNEBC firmly concludes that any differences in voter parity can be justified as a reasonable limit on the right to vote guaranteed by s. 3 of the Charter . Eleventh and finally, these proposed boundaries do not “split” any municipal or administrative boundaries, respecting that statutory criterion. Nor are any communities “orphaned” from the rest of the proposed PEDs, by being on the other side of a lake, river, or other geographical feature, respecting the statutory criterion of geographic features. Ultimately, given the factors that the FNEBC is statutorily obligated to consider, it believes that the creation of the four PEDs as described in this report best reflects how to balance those factors. Kenora—Rainy River shall encompass all parts of the current PED of Kenora—Rainy River that lie south of an approximately straight east-west line (approximation necessary due to the need to respect municipal and administrative boundaries) extending from the PED of Thunder Bay—Atikokan in the east to the province of Manitoba in the west, with Sioux Lookout lying on the north side of said line. Kiiwetinoong shall encompass all portions of the current PED of Kenora—Rainy River lying north of an approximately straight east-west line (approximations due to the need to respect municipal and administrative boundaries) extending from the PED of Thunder Bay—Atikokan in the east to the province of Manitoba in the west, with Sioux Lookout lying on the north side of said line, but excluding Weenusk (Peawanuck) First Nation and surrounding areas. Mushkegowuk shall encompass all portions of the current PED of Timmins—James Bay except the City of Timmins, but also including Weenusk (Peawanuck) First Nation and surrounding areas. Timmins shall encompass the City of Timmins itself. We note that Grassy Narrows First Nation is just “on the north side” of the proposed border between Kiiwetinoong and Kenora—Rainy River. Given this, it was particularly important for us to visit Grassy Narrows First Nation in our second round of public feedback conducted in July, where their desire to remain in Kiiwetinoong was confirmed. We propose that the new PED encompassing the City of Timmins be named “Timmins”, as the city’s boundaries and the PED’s boundaries are coextensive. This also aligns with the practice for PEDs such as Sault Ste. Marie. “Kenora—Rainy River” is an appropriate name for the new PED encompassing the southern portion of the present PED of Kenora—Rainy River given that the new PED primarily encompasses parts of the districts of Kenora and Rainy River. Moreover, the majority of constituents of the old PED of Kenora—Rainy River will remain in the new PED. The common name not only suggests continuity for these common constituents, but also prevents expense and confusion occasioned by an unnecessary name change. Finally, the vast majority of individuals in the proposed new PED from whom we have received feedback were in favour of retaining the name. The feedback we received left no doubt in our minds that incorporating Indigenous languages in the names of the new PEDs was important to the local communities. The three Indigenous languages in the area are Cree, Oji-Cree, and Ojibwe. As such, we propose that the new PEDs be given names in one of these languages, to reflect the significant current Indigenous populations and also their statuses as First Nations. Based on the feedback received, we believe “Kiiwetinoong”—the Ojibwe word for the direction “North”—is an appropriate name for the PED encompassing the current northern portion of Kenora—Rainy River. “Mushkegowuk”—the Swampy Cree name for the lowland/swampy area where the Swampy Cree’s traditional territory is located—is an appropriate name for the PED encompassing the northern portion of Timmins—James Bay. “Mushkeg” is the Swampy Cree word for “Swamp Land” and “Mushkegowuk” in this context can roughly be translated into English as “People of the Swamp Land”. We recognize that the name “Mushkegowuk” does not incorporate a name that reflects the significantly francophone population of the PED. As noted in the Preliminary Report, we considered alternative names and were open-minded to incorporating a name meaningful to the PED’s francophone population as a result of second-round feedback. However few new proposals were raised. We ultimately concluded that the name “Mushkegowuk” on its own is an appropriate name, particularly in this period of reconciliation in Canadian/Ontario history with the Indigenous population. We have outlined the constitutional criteria of effective representation flowing from section 3 of the Charter : geography, community history, community interests, and minority representation. These criteria are consistent with those prescribed by the Representation Act, 2015 : communities of interest, representation of Indigenous peoples, municipal and administrative boundaries, sparsity, density, rate of growth in the geographic areas, geographical features, the availability and accessibility of means of communication and transportation in the geographic areas, representations by members of the Legislative Assembly who represent constituencies in Northern Ontario, and other interested persons, and anything else the FNEBC considers appropriate. We have explained earlier in this report the means chosen to obtain all relevant information and opinions relative to these criteria. We came to the conclusion that the constituencies under review have very unique features and that establishing an electoral map to achieve optimal and effective representation poses serious challenges. The FNEBC is comprised of five members, the majority of whom are Indigenous. This accords with the fact that a primary object of the FNEBC is to consider Indigenous participation and representation in the electoral system. We note that the mandate was given while the Legislature had already accepted to retain the 11 PEDs in the north, avoiding reductions such as those that had been agreed to with regard to PEDs in the south. This all means that there is legislative and political recognition of the fact that voter parity must not prevent the addition of new PEDs that are necessary in order to achieve effective and fair representation in the Far North, as permitted by s. 3. We did not set aside relative voter parity in our analysis; we tried to provide for the least significant deviations, accepting only deviations that could be justified on the grounds of practical impossibility or the necessity of giving sufficient weight to other factors needed to achieve effective representation. There is no undue dilution of voter parity when there is such necessity. The claims of Indigenous persons to participate in the affairs of Ontario are of great importance; they can be accommodated without adverse impact on the democratic process. Our solution is a response to the Legislature’s call for effective representation of all peoples of the Far North, and to the extensive feedback received from those peoples. It is obvious that the creation of one or two new PEDs will further affect the overall provincial voter representation average. This was unavoidable. We were careful however to propose a map that would favour a fair voter representation in the four proposed PEDs, recognizing that the north is and will continue to be treated differently, out of pure necessity. The special attention to Indigenous representation is mainly achieved in creating a PED in the northwest, called Kiiwetinoong, where the Indigenous population is in the majority. Based on research and meetings, there was no possibility in our view of creating a logistically representable second such PED without affecting voter parity significantly. We are unanimously convinced that our decision is consistent with s. 3 of the Charter . The geography of the region, the sparse population, the uniquely difficult communications, fly-in only communities, and the great importance of Indigenous languages are all matters of utmost attention in our deliberations. The FNEBC believes the recommendation strikes the right balance between voter parity and the other criteria for effective representation in s. 3. Commencing at the intersection of a railway right-of-way and the east limit of the Territorial District of Kenora at approximate latitude 50º14’20”N. ; thence southwesterly along said railway right-of-way to its intersection with the east limit of the Municipality of Sioux Lookout; thence generally southerly and westerly along the east and south limits of said Municipality to the southwest corner thereof; thence northerly along the west limit of said Municipality to the northeast corner of the geographic township of Lomond; thence westerly along the north limit of the geographic townships of Lomond, McIraith, Breithaupt, Daniel, Rowell, Ladysmith, Wauchope, Buller and Redvers to the northwest corner of the geographic township of Redvers; thence southerly to the southwest corner thereof; thence westerly and southerly along the north and west limit of the geographic township of Smellie to the southwest corner thereof; thence westerly along the north limits of the geographic townships of Bridges, Tustin, MacNicol and Jackman to the easterly water’s edge of Silver Lake; thence westerly on the production of the north limit of the geographic township of Jackman to its intersection of the northerly production of the east limit of lot 1, concession 3, of the geographic township of Pettypiece; thence northerly to the southeast limit of lot 1, concession 5, geographic township of Pettypiece and continuing northerly along the east limit of said township to the northeast corner thereof; thence westerly along the north limit of the geographic township of Pettypiece to the east limit of the geographic township of Redditt; thence northerly, westerly and southerly along the east, north and west limits of the geographic township of Redditt to the north limit of the City of Kenora; thence westerly along the north limit of said City of Kenora to the northeast corner of The Dalles I.R. 38C; thence generally northwesterly and southerly along the north and west limits of The Dalles I.R. 38C to an intersection with the easterly production of the north limit of the geographic township of Umbach; thence westerly along said production to the southeast corner of the Minaki Local Services Board Area as described in the Schedule to Ontario Regulation 212/83; thence generally northerly, westerly and southerly along the east, north and west exterior limits of said Local Services Board Area to the north limit of the geographic township of Umbach; thence westerly along the north limit of the geographic townships of Umbach and Pelican to the southeast corner of the geographic township of Rudd; thence northerly and westerly along the east and north limit of the geographic township of Rudd to the northeast corner of the geographic township of Noyon; thence westerly along the north limit of the geographic township of Noyon to the interprovincial boundary between Ontario and Manitoba. Commencing at the intersection of the south limit of said district with a meridian line known as the 4th Meridian Line, surveyed by Phillips and Benner, Ontario Land Surveyors, 1926; thence northerly along said meridian line to the south limit of the Town of Atikokan; thence westerly along said south limit of said town to the southwest corner thereof; thence northerly along the west limit of said town and its production northerly to the north limit of the Territorial District of Rainy River. That part lying east of a line described as follows: Commencing at the most northerly northeast corner of the Territorial District of Thunder Bay; thence northerly along the production of the east limit of the Territorial District of Thunder Bay to latitude 54º00’N; thence west astronomically to the Winisk River; thence northerly along the Winisk River to the southern boundary of Winisk IR No. 90; thence westerly, northerly and easterly along the south, west and north exterior limits of Winisk IR No. 90 to where it intersects the Winisk River; thence generally northerly and easterly along the Winisk River to an intersection with the northerly production of the east limit of the Territorial District of Thunder Bay; thence northerly along the production of the east limit of the Territorial District of Thunder Bay to the north limit of the Province of Ontario. All that part of lying south of a line described as follows:Commencing at the intersection of a railway right-of-way and the east limit of the Territorial District of Kenora at approximate latitude 50º14’20”N. ; thence southwesterly along said railway right-of-way to its intersection with the east limit of the Municipality of Sioux Lookout; thence generally southerly and westerly along the east and south limits of said Municipality to the southwest corner thereof; thence northerly along the west limit of said Municipality to the northeast corner of the geographic township of Lomond; thence westerly along the north limit of the geographic townships of Lomond, McIlraith, Breithaupt, Daniel, Rowell, Ladysmith, Wauchope, Buller and Redvers to the northwest corner of the geographic township of Redvers; thence southerly to the southwest corner thereof; thence westerly and southerly along the north and west limit of the geographic township of Smellie to the southwest corner thereof; thence westerly along the north limits of the geographic townships of Bridges, Tustin, MacNicol and Jackman to the easterly water’s edge of Silver Lake; thence westerly on the production of the north limit of the geographic township of Jackman to its intersection of the northerly production of the east limit of lot 1, concession 3, of the geographic township of Pettypiece; thence northerly to the southeast limit of lot 1, concession 5, geographic township of Pettypiece and continuing northerly along the east limit of said township to the northeast corner thereof; thence westerly along the north limit of the geographic township of Pettypiece to the east limit of the geographic township of Redditt; thence northerly, westerly and southerly along the east, north and west limits of the geographic township of Redditt to the north limit of the City of Kenora; thence westerly along the north limit of said City of Kenora to the northeast corner of The Dalles I.R. 38C; thence generally northwesterly and southerly along the north and west limits of The Dalles I.R. 38C to an intersection with the easterly production of the north limit of the geographic township of Umbach; thence westerly along said production to the southeast corner of the Minaki Local Services Board Area as described in the Schedule to Ontario Regulation 212/83; thence generally northerly, westerly and southerly along the east, north and west exterior limits of said Local Services Board Area to the north limit of the geographic township of Umbach; thence westerly along the north limit of the geographic townships of Umbach and Pelican to the southeast corner of the geographic township of Rudd; thence northerly and westerly along the east and north limit of the geographic township of Rudd to the northeast corner of the geographic township of Noyon; thence westerly along the north limit of the geographic township of Noyon to the interprovincial boundary between Ontario and Manitoba. Commencing at the intersection of the west limit of the Territorial District of Thunder Bay with a base line, known as the 6th Base Line or Ross’s Base Line, surveyed by K.G. Ross, Ontario Land Surveyor, 1923; thence easterly along said base line to the southeast corner of the geographic Township of Bertrand; thence northerly along the east boundary of the geographic townships of Bertrand, McLaurin, Furlonge, Fletcher and Bulmer to the northeast corner of the geographic Township of Bulmer; thence northerly along a meridian line, known as Phillips and Benner’s Meridian Line, surveyed by Phillips and Benner, Ontario Land Surveyors, 1923, to the north limit of the Territorial District of Thunder Bay. Commencing at the most northerly northeast corner of the Territorial District of Thunder Bay; thence northerly along the production of the east limit of the Territorial District of Thunder Bay to latitude 54º00’N; thence west astronomically to the Winisk River; thence northerly along the Winisk River to the southern boundary of Winisk IR No. 90; thence westerly, northerly and easterly along the south, west and north exterior limits of Winisk IR No. 90 to where it intersects the Winisk River; thence generally northerly and easterly along the Winisk River to an intersection with the northerly production of the east limit of the Territorial District of Thunder Bay; thence northerly along the production of the east limit of the Territorial District of Thunder Bay to the north limit of the Province of Ontario. Consisting of all of the City of Timmins in the Territorial District of Cochrane. The Legislative Assembly specifically tasked the FNEBC with the decisions to add one or two PEDs to the Far North, to set the boundaries of the PEDs in the Far North, and to establish their names. The previous sections of the report explain how we responded to our statutory mandate. During our public information meetings, we also heard a great deal of feedback that was interesting, valuable, and informative, but was not directly statutorily mandated. Given our collective experience as Commissioners during this process and our prior expertise, we believe the FNEBC is well-placed to inform the Legislative Assembly of other matters to be considered in respect of the process for how electoral boundaries should be drawn in the future. We acknowledge that this does not fall within the strict confines of our statutory mandate. However, we are also of the firm opinion that we would be remiss not to share valuable insights we learned during the process of fulfilling our statutory mandate, or to inform the government of expectations and/or aspirations that may exist among the populace. First, the FNEBC asks that Ontario consider having a regular process regarding the drawing of electoral boundaries. The FNEBC offers no opinion on whether Ontario’s PEDs outside of the Far North should copy the boundaries set by the federal electoral boundary commission for the province of Ontario convened every ten years under the federal Electoral Boundaries Readjustment Act ,75 or legislate that a provincial commission establish the boundaries. But enshrining in law that there be a regular process, whatever the form, could enhance predictability and efficiency. Second, the FNEBC suggests that the province consider establishing a process for re-drawing all PED boundaries in Northern Ontario. The FNEBC heard that First Nations and/or municipalities in Thunder Bay—Superior North and/or Timiskaming—Cochrane would more naturally “fit” in PEDs with First Nations and/or municipalities in the current PEDs of Kenora—Rainy River and/or Timmins—James Bay. The present PEDs in Northern Ontario are based on data from 1991 despite demographics and the relationships between First Nations and municipalities having shifted considerably since then. Third, the FNEBC wishes to emphasize that any future process for drawing boundaries must remain independent and non-partisan. The FNEBC operated independently from the Legislative Assembly and acted in a non-partisan fashion in all of its work. Independence and non-partisanship are essential elements for the drawing of electoral boundaries that must be preserved in any future process. These values should be represented in the composition and mandate of any future commissions. Fourth, the FNEBC believes that it would be helpful for future commissions assigned to redraw boundaries to be given specific guidance in statute as to the acceptable deviations from the average population in a PED in Ontario. Our statute established the factors that we were to consider, but not the maximum permitted deviation from representation by population. Statutorily established variances could be nuanced—e.g., different for Southern, Northern, and Far Northern Ontario. Even these could be varied from in exceptional circumstances, as for example, federal legislation permits.76 Certain PEDs could also be exempted, either due to geography, the presence of minority voters, or Indigenous peoples. The Supreme Court of Canada in Carter held that deviations from voter parity could be acceptable if justified according to the criteria it set out, but also contemplated that some variations would be so great as to be inconsistent with the primary principle of voter parity. Guidance from the Legislative Assembly as to what deviations are permitted would be desirable in any future process. Fifth, the FNEBC asks that the Legislative Assembly consider recognizing the transportation and communications challenges posed by the large geography of the Far North by adjusting upward the spending limits imposed on nomination contestants and candidates in the PEDs of the Far North. Air travel to remote communities not accessible by road or rail is expensive. Spending limits are calculated based on the number of electors in each PED.77 Given the relatively small populations in the PEDs, the FNEBC heard that these limits are inadequate to fund campaigns that truly reach all members of the community. Similarly, the Legislative Assembly should consider amending the Legislative Assemblies Act to increase the funding available for Far North MPPs to travel to see their constituents.78 We heard in our public information meetings that the cost of travel and communication was a deterrent for contact between those seeking and holding elected office and voters in the Far North. The Legislative Assembly should look to remedy this problem, ideally prior to the general election scheduled for June 2018. Sixth, the FNEBC asks the Legislative Assembly to consider giving future provincial governments an obligation to implement—rather than merely introduce legislation to implement—the boundaries proposed by future electoral boundary commissions. Other Canadian jurisdictions have an obligation to implement the recommendations of electoral boundary commissions, and this can be done through having commission reports become law upon the next dissolution of the legislature after being released (e.g., Manitoba).79 Electoral boundary commissions are not infallible. But removing any discretion on the part of the government to “not implement” their recommendations would help ensure that commissions continue to operate in a non-partisan and independent fashion, and continue to be perceived to be non-partisan and independent. Seventh, the FNEBC requests that consideration be given to further steps to increase Indigenous representation and political participation in Ontario. The FNEBC emphasizes that increasing Indigenous representation is of great importance in this period of reconciliation in Ontario and Canada’s history. As the TRC noted, Indigenous and non-Indigenous Canadians must continue to live alongside each other. Dialogue between Indigenous and non-Indigenous Canadians is necessary to improve this ongoing relationship. Non-Indigenous Canadians must respect traditional Indigenous knowledge, political practices, and cultures regarding how to participate in public life. The Legislative Assembly should consider further measures to encourage Indigenous candidates to run for provincial office and to increase voter turnout among Indigenous peoples in Ontario. In this respect, the FNEBC encourages that more funds be allocated for outreach and education to Indigenous populations. The FNEBC heard understandable historical reticence on the part of many Indigenous persons to participate in the provincial electoral process. But the FNEBC also heard that further education and outreach may assist many Indigenous persons who are currently ambivalent about the provincial electoral process—or who genuinely do not know much about it—to make a decision about whether and how to participate in the provincial electoral process. In a democracy where representatives are chosen from geographic territories, ensuring effective representation can be challenging. As such, the FNEBC also urges legislators to consider the possibility of creating unique seats in the Legislative Assembly that are dedicated for the purposes of Indigenous representation. This could be accomplished in several ways, such as the model in New Zealand to ensure Maori representation. Such an approach would be a departure from the tradition of contiguous, geographically based districts, but new practices are needed to ensure effective representation of Indigenous peoples. The consent of Indigenous peoples for any such plan would be essential for its legitimacy. New Brunswick for example abandoned a proposal to establish guaranteed PEDs for Mi’kmaq representatives after the Mi’kmaq rejected the plan.80 The FNEBC understands and respects the historical reluctance of many Indigenous peoples to participate in provincial politics. We heard on several occasions understandable concerns that increased representation in the Legislature could come at the expense of Indigenous self-government. The FNEBC nonetheless firmly believes that increasing Indigenous representation in the provincial legislature can be complementary—rather than in opposition—to Indigenous self-government, if established with consent and in the spirit of reconciliation. A current or former judge of a court in Ontario, who shall act as the chair of the Commission. A member of the faculty of a university in Ontario. Two community representatives who identify as Indigenous persons. 2016, c. 33, s. 36 (1). Remuneration (2) Members of the Commission, other than the Chief Electoral Officer and the chair of the Commission, if the chair is a current judge, may be paid such remuneration as may be determined by the Lieutenant Governor in Council. 2016, c. 33, s. 36 (1). Reimbursement for expenses (3) Members of the Commission are entitled to be reimbursed for reasonable expenses incurred in the work of the Commission, as determined by the Lieutenant Governor in Council. 2016, c. 33, s. 36 (1). Staff (4) The Commission may engage staff to assist it in its work, and those staff shall be paid salaries or wages comparable to those determined under Part III of the Public Service of Ontario Act, 2006 for public servants employed under that Part, except for persons whose services are provided under subsection (5). 2016, c. 33, s. 36 (1). the Crown for the provision of services by public servants employed under Part III of the Public Service of Ontario Act, 2006. 2016, c. 33, s. 36 (1). Charge on CRF (6) All remuneration, expenses and other costs incurred in the work of the Commission shall be paid out of the Consolidated Revenue Fund. 2016, c. 33, s. 36 (1). Mandate (7) The Commission shall consider and make recommendations with respect to the creation of at least one and no more than two additional electoral districts within the geographic areas occupied under this Act, at the time of the establishment of the Commission, by the electoral districts of Kenora-Rainy River and Timmins-James Bay and with respect to the boundaries and names of all of the electoral districts in those geographic areas. 2016, c. 33, s. 36 (1). anything else that the Commission considers appropriate. 2016, c. 33, s. 36 (1). Preliminary and final reports (9) The Commission, after holding public hearings and performing any other consultation it considers appropriate, shall release a report containing its preliminary recommendations, and, after holding further public hearings and performing any other consultation it considers appropriate, shall produce a report containing its final recommendations. 2016, c. 33, s. 36 (1). Submission of final report (10) Within three months of the day when all the members of the Commission have been appointed, the Commission shall submit the report containing its final recommendations to the Attorney General, who shall promptly make the report public. 2016, c. 33, s. 36 (1). Recommendations by consensus (11) The Commission shall operate by consensus in making its decisions and recommendations, but in the case of an inability to reach consensus with respect to its preliminary or final recommendations, the recommendations of the dissenting member or members shall be included in the Commission’s report. 2016, c. 33, s. 36 (1). Duty to introduce legislation (12) A member of the Executive Council shall, before October 30, 2017, introduce legislation to implement the final recommendations of the Commission. 2016, c. 33, s. 36 (1). Repeal (13) This section is repealed on December 31, 2017. 2016, c. 33, s. 36 (1). Terms of Reference of FNEBC. Johnson, Larry, “Frozen Districts: The Status of Electoral Redistribution in Ontario”, Legislative Library and Research Services June 2014 at p 2 (“Johnson”); Kaye, Philip, “Redistribution of Electoral Districts in Ontario: Current Issue Paper 24”, Legislative Research Service September 1996 at p 4 (“Kaye 1996”). Kaye 1996, ibid, at 3-4. Ibid; Bellamy, David J., Pammett Jon H., Rowat, David Cameron, “The Provincial political systems: comparative essays” 1976 Toronto: Methuen. Kaye 1996, supra note 3 at pp 11–16. Truth and Reconciliation Commission of Canada, “The Final Report of the Truth and Reconciliation Commission, Canada’s Residential Schools: Reconciliation,” 2015 (“TRC”) 26 <http://nctr.ca/assets/reports/Final Reports/Volume_6_Reconciliation_English_Web.pdf>. The unconditional right to vote of all Status Indians was established in 1960. However, different Indigenous groups received the right to vote at different times. The Inuit received the right to vote in federal elections in the 1950s – however, most lived in remote communities and had no means of voting. The Métis, however, faced no legislative restrictions to vote so long as they met basic qualifications such as age and ownership of property: Ladner, Kiera L., and McCrossan, Michael, “The electoral participation of Aboriginal people” 2007 Elections Canada; Leslie, John F “Indigenous Suffrage” June 30, 2017, The Canadian Encyclopedia <http://www. thecanadianencyclopedia.ca/en/article/indigenous-suffrage/>. “History of the Vote in Canada: Chapter 2 from Privilege to a Right 1867 – 1919” Elections Ontario 2016 <http://www.elections.ca/content.aspx?section=res&dir=his&document=chap2&lang=e#a25>. Statistics Canada, “Aboriginal Peoples: Fact Sheet” March 14, 2016 <http://www.statcan.gc.ca/pub/89-656-x/89-656-x2015001-eng.htm>. Statistics Canada “Census Profile, 2016 Census” adjusted by INAC with the 2017 on reserve information. Statistics Canada “Census Profile, 2011 Census” (not adjusted by INAC on-reserve data). Using the non-adjusted 2016 Statistics Canada Data, the total population of the two PEDs is 149,229 and the growth rate would be a decrease of 0.1%; Statistics Canada, “Population size and growth rate, Canada, provinces, and territories, 2006 to 2011 and 2011 to 2016” March 2017 <http://www.statcan.gc.ca/daily-quotidien/170208/t002a-eng.htm>. Statistics Canada “Census Profile, 2016 Census” adjusted with INAC registered population as of April 2017, percentage of Indigenous from 2011 Statistics Canada Census of Population. Based upon the changes in the Indigenous populations in the PEDs according to Statistics Canada. This was calculated by dividing the province’s total population of 13,448,494 by the upcoming legislated 122 PEDs, not the current 107 PEDs. Statistics Canada “Census Profile, 2016 Census” May 2017 <http://www12.statcan.gc.ca/census-recensement/2016/dp-pd/prof/index.cfm?Lang=E>. Johnson, supra note 3 at 6-7. This occurred with the exception of a minor change in the PED containing the Municipality of Algonquin Highland. Indigenous and Northern Affairs Canada “Treaty Guide to Treaty No. 9 (1905 – 1906)” <http://www.aadnc-aandc.gc.ca/eng/1100100028855/1100100028857>. Nishnawbe-Aski Nation “About Us”, 2017 <http://www.nan.on.ca/article/about-us-3.asp>. Grand Council Treaty #3 “History: Treaty #3 Territory”, 2017 <http://www.gct3.ca/about/treaty-3-territory>. Statistics Canada, “Aboriginal Peoples in Canada: First Nations People, Métis and Inuit” <http://www12.statcan.gc.ca/nhs-enm/2011/as-sa/99-011-x/99-011-x2011001-eng.cfm#a4>; Métis Nation of Ontario, “The Métis Nation” <http://www.metisnation.ca/index.php/who-are-the-metis>. The MNO does not speak for other non-MNO Métis communities in Ontario. Daniels v Canada (Indian Affairs and Northern Development) , 2016 SCC 12. 2011 National Household Survey, Statistics Canada. This captures data for the Métis population through a self-identification process, defined as “the ethnic or cultural origins of the respondent’s ancestors”. It is possible that a person may report more than one ethnic origin. Ministry of Transportation, “Towards a Northern Ontario Multimodal Transportation Strategy, Discussion Paper” October 2016 (“MTO”) <https://nomts.ca/discussion-paper/>. Meetings with Theresa Hall – Week of May 22, 2017. Meetings with Eric Fisher – Week of May 22, 2017. Office of the French Language Services Commissioner of Ontario “Francophones in Ontario” <http://csfontario.ca/wp-content/uploads/2014/10/2014.09.18-Francophones-in-Ontario_infographic_J.pdf>. Mother Tongue refers to the first language learned at home in childhood and still understood at the time of census. Statistics Canada “French and the francophonie in Canada”, June 2017 <http://www12.statcan.gc.ca/census-recensement/2011/as-sa/98-314-x/98-314-x2011003_1-eng.cfm>. Statistics Canada “Census Profile, 2011 Census”. Statistics Canada 2017 “Land and Freshwater area”, by province and territory. This number is based on the provincial boundary of Ontario and includes lakes and rivers <http://www.statcan.gc.ca/tables-tableaux/sum-som/l01/cst01/phys01-eng.htm>; Government of Ontario “About Ontario” June 2017 <https://www.ontario.ca/page/about-ontario>. Government of Ontario “Far north of Ontario” <https://www.ontario.ca/rural-and-north/far-north-ontario> (“Gov of Ont”). Northern Policy Institute “Weathering winter roads – what is the best route?” April 7 2017 <http://www.northernpolicy.ca/article/weathering-winter-roads-–-what-is-the-best-route-1354.asp>. Gov of Ont, supra note 45. Immigration North Western Ontario: Pickle Lake “Town of Pickle Lake”, June 2017 <http://www.immigrationnorthwesternontario.ca/Communities/Town_of_Pickle_Lake.htm>. Ibid. However, there are many difficulties in terms of frequency and convenience. According to the study, bus routes are not in tune with the needs of the communities. For example, there is a bus route from Sioux Lookout to Thunder Bay; however, residents noted there is greater travel demand and needs between Sioux Lookout and Dryden, though there is currently no service for this connection. Reference Re Provincial Electoral Boundaries (Sask. ),  2 SCR 158 (“ Carter ”). Carter, supra note 59 at 184. Reference re the Final Report of the Electoral Boundaries Commission , 2017 NSCA 10 (“ Nova Scotia Reference ”). Representation Act, 2015 , SO 2015, c C31, s. 4(8). This applies only to deviations from the electoral quotient within provinces. The FED of Labrador has a population of 26,728, a 76% variance from the average population of an FED. Nova Scotia Reference, supra note 65 at 12. Carter, supra note 59 at 189. This number under-represents the number of participants at the meeting as many community members chose not to sign in. Reference Re Secession of Quebec ,  2 SCR 217. The word “minority” in this context is used simply to statistically describe peoples who are less than 50% of the population in a particular area. Indigenous peoples have a unique constitutional status. RSC 1985, c E-3, ss. 3ff. Election Finances Act , RSO 1990, c E7, s 38. Section 67(6) of the Legislative Assemblies Act , RSO 1990, c L10 treats Kenora—Rainy River and Timmins—James Bay the same as most other Northern Ontario PEDs in this respect. Electoral Divisions Act , CCSM c E40, s. 10(5). Niemczak, Peter, “Aboriginal Political Representation: A Review of Several Jurisdictions” Library of Parliament, 27 October 2008, <https://lop.parl.ca/content/lop/researchpublications/bp359-e.htm>. It should be noted that the spelling of “Kiiwetinoong” varies between Indigenous languages and dialects.